Its been raining on and off, but its not the rain that's bothering me today its the blustery gale force winds. Across the West and Central Belt of Scotland there have been severe weather warnings of high winds that will cause disruption and destruction. And its true, the wind has been gushing all day at 70 - 80mph. In some parts of Scotland homes are without electricity as power cable lines have come down, trains have been cancelled and trees have fallen. From my own window, I've watched our bird table topple over, plants pots being flung from our garden into the neighbours. I've also watched peoples bins being knocked from their front gardens and then scuttle down the road. I am fretting that the recent roof work will be damaged with slates being dislodged and then knocked down and the costly repaired leaking roof will continue once again. Unfortunately, our upper cottage flat is at the bottom of the street and when they come: that is the wind and rain, they give it a mean battering. I am trying my utmost not to think about it, but its really hard not too when its loud, harsh and knocking literally (swaying tree branches) on your windows. These pot stickers were much more golden and crispier than my first attempt. 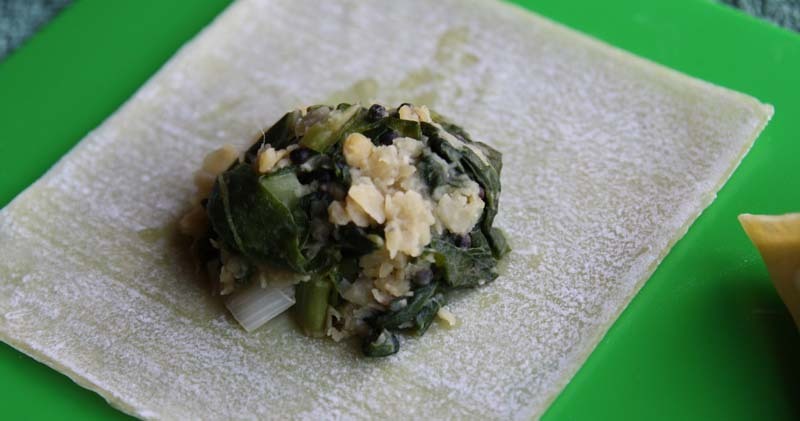 It has a simple filling of red lentils and chard. The Swiss Chard is from my own garden plot and the lentils from my shrinking store cupboard. I accompanied the pot stickers with a coriander dipping sauce. My oh my, not only was it heavily ginger scented, the ginger dominated the usually overpowering coriander. I have to admit, I wasn't too keen on the dip and may in future make a different lightly spiced dipping sauce. 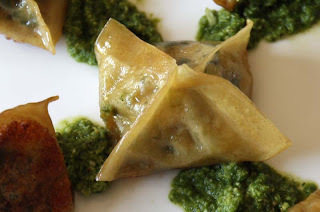 I am sending this 'Red Lentil and Chard Potstickers' to My Legume Love Affair. MLLA was founded by Susan of The Well Seasoned Cook. This month MLLA #35 is being hosted by Smitha of Kannada Cuisine. In a large pan, warm the oil over medium heat. Add the mustard seeds. Saute the seeds until they start to pop, then add the spring onions. Cook , stirring well, for a couple of minutes. Stir in the chard and then the ginger. Mix well. Cook until the chard has wilted. Stir in the lentils and season to taste. Cook for about five minutes, then remove from he heat and allow to cool. 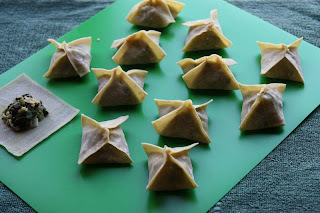 Place a teaspoon of the lentil mixture into the centre of each wonton wrapper. Brush the edges with water. Bring up two opposite points of the wrapper over the filling and pinch them together int he centre. Then bring the other opposite points to the centre and pinch together. Pinch all the edges together to seal. Heat 1 tablespoon of the peanut oil in a large non stick pan over medium-high heat. 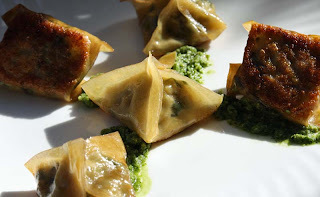 Place dumplings in the pan, you will need to do this in batches as you do not want to crowd the pan. Cook for about 3 minutes, until golden. Stir in half the tamari, then half of the water. Cover and reduce the heat to medium and cook for 5 minutes. Uncover and cook until the water has evaporated. Repeat with the remaining dumplings. Serve immediately. 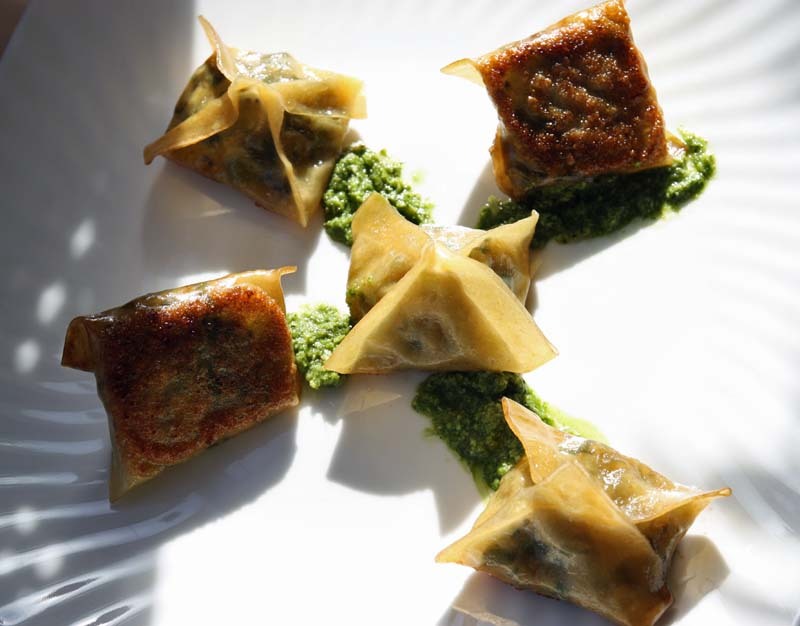 *If you don't want to make pot stickers, you can steam these dumplings in a steamer for 4 - 7 minutes or until firm, but still tender. In a blender or food processor, combine all the ingredients. Blend until smooth. If the sauce seems to thick, add enough water until you have reached your desired consistency. Recipe adapted from Food From the Spirit Manuela Dunn Mascetti. Great recipe! These look tasty! Yes, the weather has been pretty grim, hasn't it? Even down here in the South we have had some very strong gusts (though probably nowhere near 70 - 80 mph). Just to add to your woes, you are now going to have to contend with another ash-cloud from Iceland. Maybe the ash will be beneficial to the gardens though? Presumably it is full of minerals. I love potstickers! There's something about the crispy/chewy texture that is irresistible. 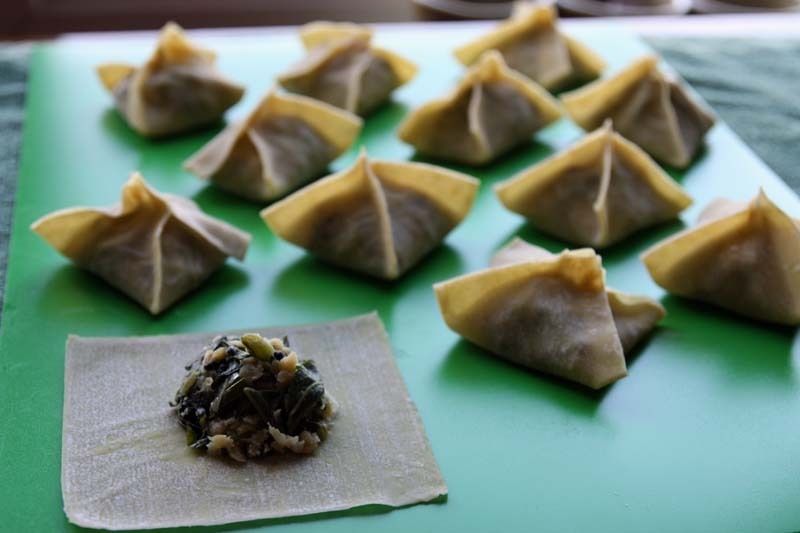 I really recommend making dumplings with Gyoza/Jiaozi wrappers (available in the freezer of pretty much any Chinese store). They're very different from wonton wrappers (which are eggy & thin), they are thicker & made with flour & water (and if you have the time, lots of fun to make yourself). I could eat them all day long! I know it's easy to say, but hard to do, but don't worry about the roof. It should be more secure now than it's ever been, and the work should be guaranteed. Sorry to read that your getting the bad weather too, but I guess your pleased its not neasr 70 - 80 mph. When we had a greenhouse - at home and the allotment - both had been destroyed by the high winds. Yeah the Icelandic ash cloud is hovering. We had to ocntend with it last year when we flew out to see my in-laws in Cyprus - our plane was the only one that was let off the ground in Glasgow. We haven't got any plans to fly anywhere right now, but who knows we may wake up one morning and see a layer of the black stuff. We can't see any slates on the ground, but will go out in a while to check it out. Can't go right now, as its pounding with rain. I'm planning to make a variation again but this time as you've written for a bowl of hot and sour soup. I'm not a noodle person, so the potstickers have been a joy to discover and enjoy. I too have noted that I like the crispy/chewy texture. I'm gonna be making some more dumplings. I wil have a look for the Gyoza/Jiaozi wrappers the next time I am at SeeWoo. I am planning to make the dumpling wrappers from scratch oneday. Thanks for your encouragement about the roof. We only got the patch where the water was coming through; and thats where the wind has been catching, its as if the roofers didn't pin them down well. D has rung them and when the weather eases down, they will be out to check it again. So far so good though, not slates on the ground, but I'm afraid to send D up in the attic! Ohhhhhhhhh yum! Great post! I'll make those pot stickers, I love wonton and dumplings of every kind! and have masses of coriander in the garden too. Lucky you to have home gorwn coriander! The lentil filling was good, the sauce not so much - yes teaspoons in place of tablespoons would be wise. I never thought of filling potstickers with lentils, but it must taste really good! Now I know what to try with that pile of wrappers waiting in my freezer. The lentil potstickers were good. I wasn't keen on the dip though.